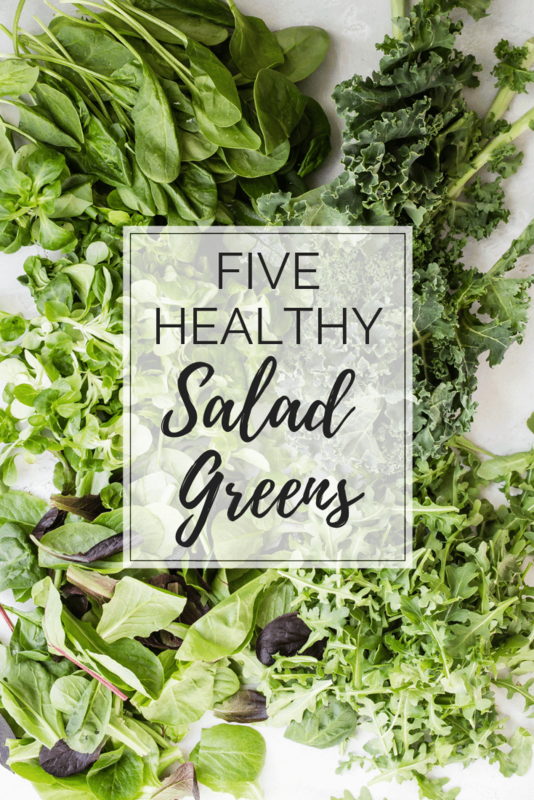 Check out my five favorite salad greens! These are my go-to varieties whenever I’m making a salad or healthy grain bowls! We’re big on salads at my house, and there’s a good chance I’m serving one up at either lunch or dinner any day of the week. I lean towards hearty kale salads in the winter and use more tender greens for spring and summer salads. Either way, there are plenty of salad variations to keep everybody happy and I always have a side dish that’s healthy and comes together easily. 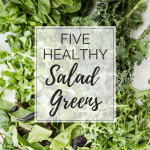 With an infinite number of salad ingredients and dressings ready to come together, I stick with the same five basic salad greens as a base for building delicious salads. I’ve narrowed down my favorites to arugula, spinach, spring mix, mache, and kale, and it’s easy to assemble an epic salad with any combination of these greens or a simple salad with just one leafy green and a flavorful vinaigrette. Whether you need a salad for entertaining or just feeding your family, use any of the salad greens below for a perfect salad every time. With a bold, peppery flavor, arugula can stand on its own in a salad. Scots, Brits, and kiwis refer to this bold leafy green as rocket. Arugula is in the same botanical family as broccoli and kale, so you know it’s loaded with good nutrition. In the summer I mix up a simple arugula salad with shaved parmesan and lemon vinaigrette and pair it with a pizza straight out of my wood-fired oven. It’s an epic flavor combo. A simple arugula salad also works well with grilled meat or fish and can be mixed with mache or a spring lettuce mix to tone down the peppery flavor. I’ve been known to go a little crazy and whip up a Panzanella salad with arugula, heirloom tomatoes, and some good crusty bread. Perfection! Arugula leaves are tender and will wilt under a heavy dressing, so skip the creamy dressings. Dress arugula with a light vinaigrette that’s sweetened with a touch of honey or maple syrup. I find that arugula tastes best with this simple dressing: salt, pepper, vinegar, lemon juice, olive oil and a touch of honey. You can buy arugula bagged or in a bunch. Bagged arugula typically has smaller leaves and the stems can be left intact or removed if you prefer no stems. Arugula in a bunch has tough stems, so they will need to be cut off at the base of the leaves before serving. 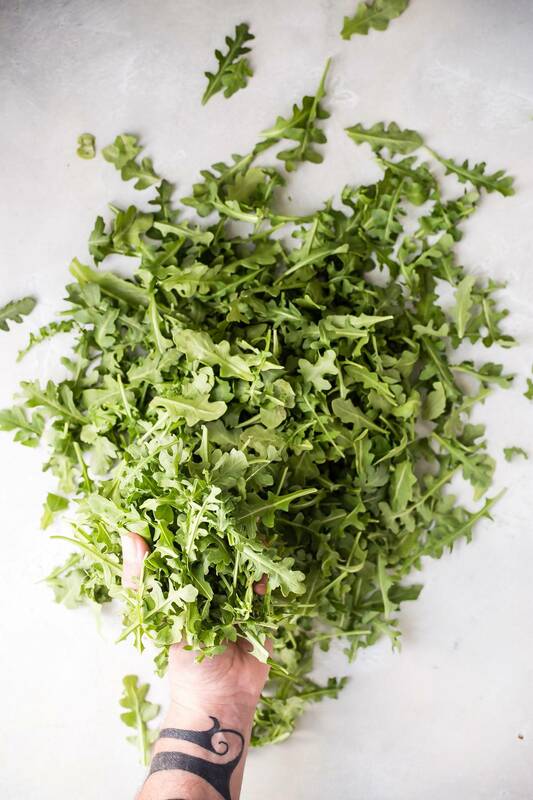 If you buy bagged arugula, it usually comes triple washed and doesn’t need to be washed again before serving. Bunched arugula should be rinsed thoroughly in a colander and spun dry, then rolled in paper towels and stored loosely in a plastic bag, lasting in the fridge for up to a week. Spring mix is one of my go-to salad greens. It contains a mix of various young or baby leafy greens, including romaine, chard, spinach, red leaf, radicchio, and/or beet tops. With a balance of sweet and bitter greens, spring mix is versatile in any number of salad combinations. Keep the ingredients traditional with cucumber and tomatoes drizzled with Italian dressing, or go a sweeter route with sliced fruit, berries, nuts and crumbled blue cheese. From pasta to meat, spring mix salads compliment any main dish. 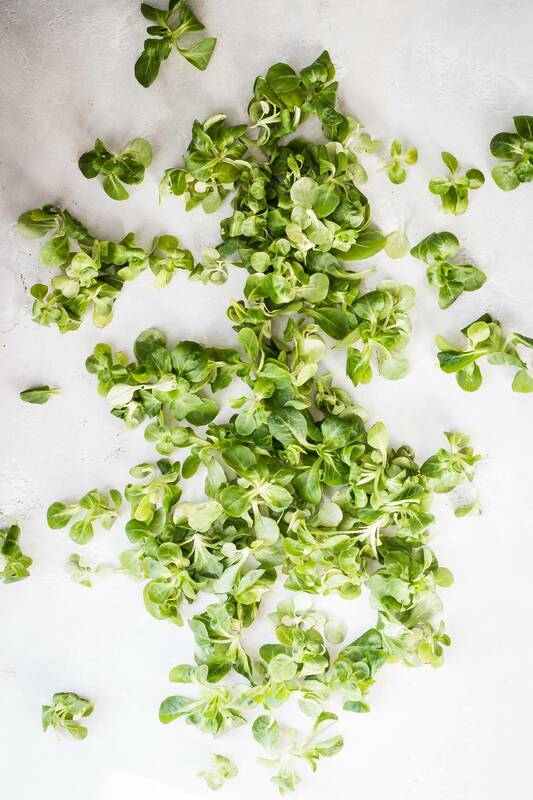 Spring mix has a medley of young leaves that are tender and don’t take well to a heavy, creamy dressing. Make a simple, light vinaigrette and dress it right before serving. You don’t want to soak the leaves and weigh them down. Spring mix comes triple washed in a bag or clamshell. Store it in the crisper section of your fridge and use as needed. Spring mix should last through the week, but check the leaves for rot periodically and discard if it starts to get gunky. Kale is a hearty green that has tons of nutritional benefits and works in a wide variety of salads. 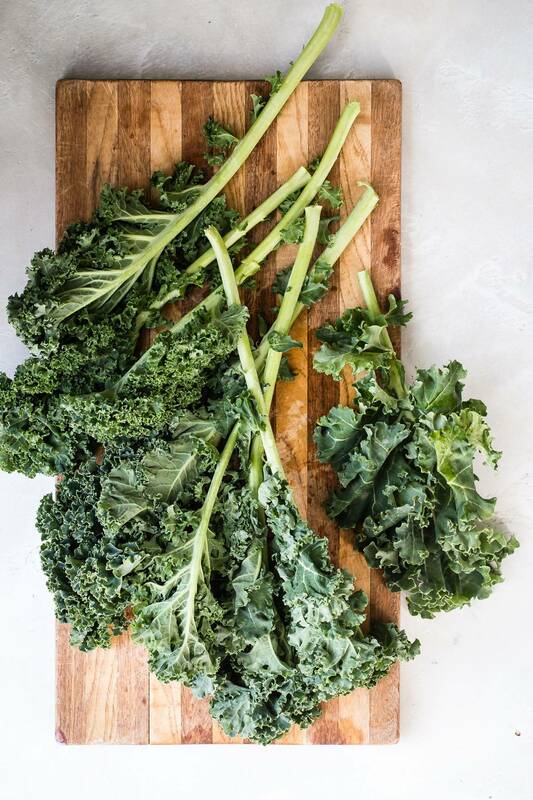 I use kale in salads all year long, working in fall and winter apple walnut kale salads and citrusy kale salads, then switching over to baby kale for lighter salads in the summer. My beet, carrot and kale salad with Asian dressing is a favorite at summer barbecues served with tofu or meat skewers. Kale is hefty and holds up to any dressing from creamy bacon ranch to a lemon vinaigrette. Mature kale can be purchased in bunches. Store the bunch in the fridge in a produce bag, then wash and spin dry the leaves. The stalk that runs up the center of a mature kale leaf is tough, and I cut the stalks off before rolling the leaves and slicing the kale into salad-sized ribbons. If you want less-tough kale leaves, massage with a light sprinkling of sea salt for about 30 seconds before adding other salad ingredients. Baby or micro kale comes in bags or clamshells and is triple washed. It can be stored in the crisper section of your fridge and lasts well over a week in my experience. Although mache has been growing in French pastoral farm fields for centuries, it’s fairly new to the salad scene for most of us. It has a subtly sweet, slightly nutty taste with a succulent texture. It also goes by the names lamb’s lettuce and corn salad. Toss mache with citrus in a winter salad or mix it with fresh garden peas, artichoke hearts and herbs drizzled in a lemon vinaigrette. Mache has juicy and tender leaves that pair well with a simple vinaigrette. Mache usually comes triple washed in a bag or clamshell. Its leaves come in small clusters or rosettes, so you’ll need to pull the small leaf clusters apart to separate them before serving. Store mache in the crisper section of your fridge and use as needed. Mache lasts several days when stored in the fridge. If you buy it fresh from a farmer’s market, wrap the bunch in a paper towel and store loosely in a container. Cut off the roots, rinse thoroughly, and spin dry before serving. 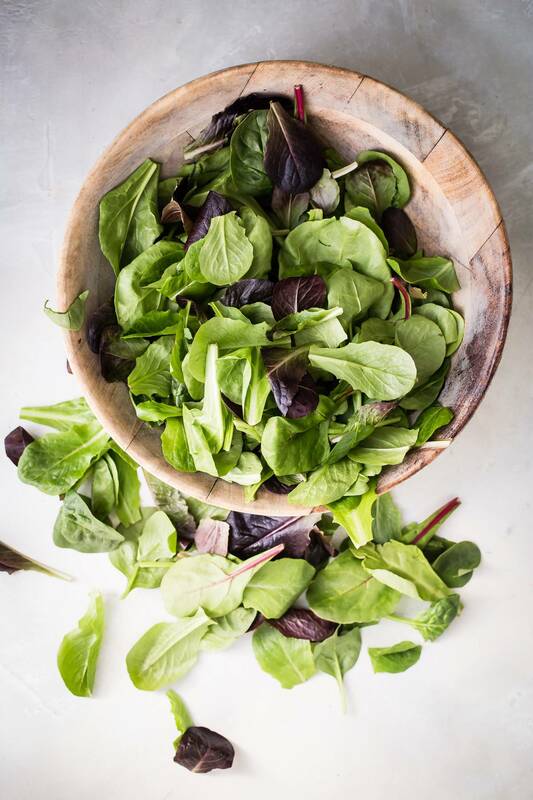 You can find bagged baby spinach year-round in the produce aisle, which makes serving fresh salads all year long more than a little convenient. Spinach leaves work just as well in winter salads as they do mixed in lighter summer salads. A classic strawberry spinach salad balances sweet fruit, tangy goat cheese and smoky bacon with dark green spinach as a base. Pair this with a pan-seared steak for an epic meal. I’ll sometimes toss in sweet peaches or nectarines in place of the strawberries and add some nuts and blue cheese. You can toss spinach leaves in just about any salad and it will taste good. Baby spinach has more tender leaves and does well with a lighter vinaigrette whereas mature spinach can hold up to a thick and creamy dressing. 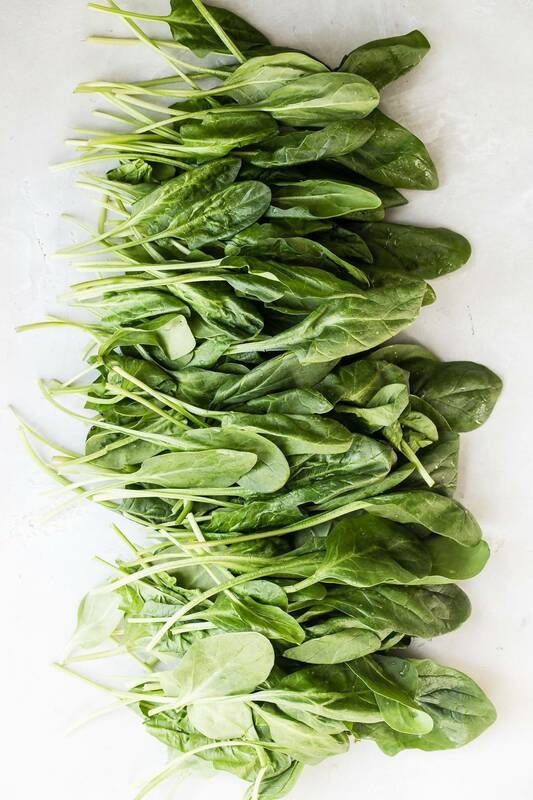 If you buy triple washed baby spinach in a bag or clamshell, store it in the crisper section of your fridge and use as needed. This should last through the week or until you start to notice the leaves getting gunky. If you’ve never had fresh spinach straight from a garden or farmer’s market, it’s worth trying. For garden spinach, trim off the stems at the base of the leaves and rinse thoroughly under running water. Spin dry in a salad spinner, wrap in paper towels and store loosely in a container or plastic bag in the fridge for up to a week. Check out these other recipes using healthy salad greens! Don’t forget to tag me @foodnessgracious if you use these delicious salad greens! I love seeing what everyone is making. You can follow me on Instagram, Facebook, and Pinterest so that you’ll never miss my latest posts! A great go-to post when you’re in a salad or grain bowl rut!